A pre-order for the HTC Rhyme is starting exclusively at Target on September 21, but HTC just announced that it’s actually going to be available in stores on September 29, next Thursday. The device, sporting a 3.7″ WVGA display, single-core 1GHz processor, 5MP rear camera, front camera for video chatting and Sense 3.5 can be had for $199 on a new 2-year contract. Seems steep for a single-core phone without 4G LTE? Well, HTC is throwing in a docking station, charm indicator, and tangle-free earbuds into the box, three accessories that would normally run you upwards of $50. No Beats by Dre integration and possibly a non-removable battery – interesting. For a whole bunch of videos and pictures, hit the jump. NEW YORK CITY – September 20, 2011 – HTC Corporation, a global designer of mobile devices, today unveiled HTC Rhyme™, a new kind of phone created for people who require advanced features but want a phone that is sleek and fits seamlessly into their lives. The result is the elegant HTC Rhyme that delivers a fresh approach of integrating distinct colors, HTC Sense™ and complementary accessories for a natural personal experience. HTC Rhyme offers a smart, elegant unibody design with every detail carefully crafted to deliver a unique sensory experience. The materials, the curves, and the dimensions are all designed to feel great in your hand, without sacrificing advanced features. 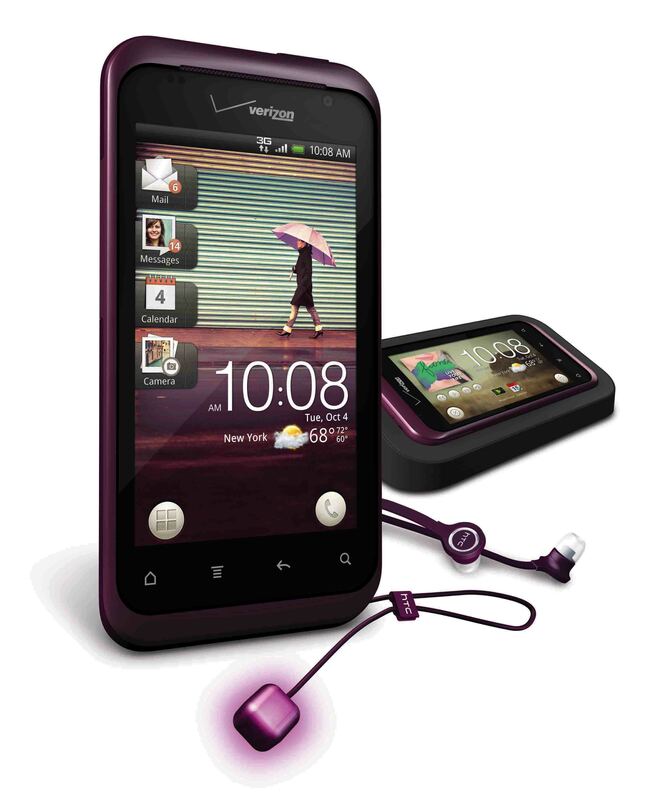 HTC Rhyme comes in three colors: Clearwater, Hourglass and Plum, the color Verizon Wireless will be offering in the U.S.
HTC Rhyme is not only defined by its soft, simple design and distinct color scheme but by the refreshed HTC Sense experience. This unique twist on HTC Sense carries over the visual language of the hardware design and includes an all-new home screen that provides a clean and uncluttered way to interact with the essentials. The home screen enables quick, uncluttered previews of your appointments, messages or whatever is important to you. HTC selected custom wallpapers to offer a variety of original art to complement the HTC Rhyme experience. With a beautiful 3.7-inch WVGA, super LCD display and high-quality stereo sound, HTC Rhyme also offers advanced imaging capabilities that begin with its 5-megapixel camera that includes auto focus, power LED flash and instant shutter for capturing those memorable moments whenever they arrive. In addition, the camera features a number of photo-taking and sharing elements, including face detection, which ensures that friends are always in focus, action burst scene, which automatically takes five consecutive shots of a scene, and panoramic mode, which lets users stitch several photos for those larger-than-life views. The HTC Rhyme’s locked home screen can be customized to display the most important content, making it quick and easy to see social updates, photos, snapping a photo or the weather forecast by simply turning on the display. HTC Rhyme makes entertainment come to life through HTC Watch, which features a wide selection of movies and TV shows that can be downloaded for instant viewing. HTC Rhyme’s suite of accessories is designed with the same sensory focus in both function and style. Created to help you experience HTC Rhyme as a natural part of your life, the integrated accessories make your phone more personal than ever before. · HTC Rhyme Docking Station – The Docking Station simultaneously recharges the phone while turning the Rhyme into an alarm clock and music center so you can wake to your favorite songs played directly from the built-in Bluetooth capable speakers. · HTC Rhyme Charm – The Charm is an innovative approach for discretely alerting you to incoming calls or messages while the HTC Rhyme is deep in your bag. The Charm is a small light-emitting cube that attaches to the phone by a cord that can dangle from your bag and also be used to quickly pull the phone out of your bag. It also makes it easy to find your phone buried in your cluttered purse or backpack. · HTC Rhyme Sports Armband – The Sports Armband allows you to work out in style while keeping your apps and music close to you. · HTC Rhyme Tangle Free Headphones – The Tangle Free Headphones take the hassle out of listening to your favorite music. · HTC Rhyme Bluetooth® Headset – The wireless headset follows the same design cues as the phone itself and enables for easy hands free use. · HTC Rhyme Bluetooth® Car Speaker – The wireless speaker clips onto sun visor in your car for easy and safe driving. HTC Rhyme will be available in the coming weeks in the United States, exclusively with Verizon Wireless, and across Europe, Middle East, Africa and Asia-Pacific in October. In the U.S., the Docking Station, Tangle Free Headphones and Charm will be included in the box. HTC Corporation (HTC) is one of the fastest growing companies in the mobile phone industry. By putting people at the center of everything it does, HTC creates innovative devices that better serve the lives and needs of individuals. The company is listed on the Taiwan Stock Exchange under ticker 2498. For more information about HTC, please visit www.htc.com.